In partnership with Barnabas Foundation, Ligonier is pleased to offer a giving opportunity that can increase your income and provide significant tax benefits while securing future support for our vital outreaches. Through a Charitable Gift Annuity you make a gift that pays you an income for life or the lives of you and your spouse. The rate of return is based on your age at the time of your gift and will never change no matter the fluctuations of the markets or economy. 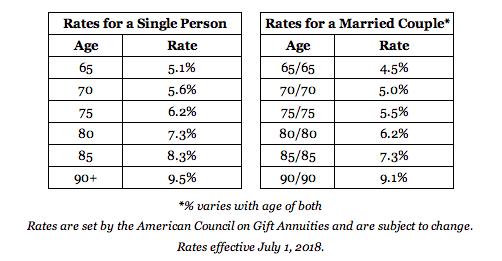 Here are some sample rates. When you establish a Charitable Gift Annuity in exchange for a donation of cash or securities, you not only receive income for life, but typically receive a significant charitable tax deduction for a portion of the gift. In addition, a part of your annual payout will be tax-free. After you are gone, the remainder of the gift will go to Ligonier Ministries to proclaim truth and advance the gospel. The satisfaction of knowing you will leave a legacy of faith. Contact our Gift Planning Officer by emailing stewardship@ligonier.org or by phoning 1-800-220-7636 ext. 1185 for more details. We will be happy to provide you with additional information and confidential illustrations of how a Charitable Gift Annuity might benefit you.